I stopped there, but you could do it one or two more times around. For added cuteness you can switch thread colors or use the same. This time go another 1/4″ in (so 1/2″ seam allowance). Your stray hair is disgusting. However, since Clare has pooped in the tub the last 2 times she has bathed and I've had to fish it out of the toys… with a face cloth, I'm a bit numb. I cannot muster up my usual stray-hair reaction. 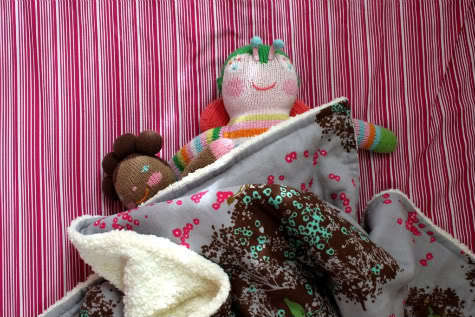 Would you happen to be able to tell me where you goT or what that tree fabric in the blanket for Quinn is called? Was the Minkee fabric difficult to work with? I've heard that it can be a pain, and messy… and that sewing machines don't like it much. stephanie, i didnt have any problems with it. hmm. I can hardly wait to make this blanket! I am prewashing now… and yeah I can't stand the wait. LOL! melissa – i don't know! i can't remember! i think it was from joanne's but i haven't been able to find it since. i am sad because i totally love it, it's so cozy, but i don't know where to buy more! its a little spendy tho! Maybe i will check my joannes tonight : ) Have a good weekend! So theres no batting or anything needed in this just the two fabrics sewn together? So how do you get the actual patterns? I can't seem to find them. Thanks. I make my baby blankets the same way. I have used all different types of materials – Flannel, woven cotton, flannel backed satin, minky dot, fleece, other plush material (which was THE WORST to work with! It shed all over! ), and even satin. My toughest one was a smooth slippery silky material on one side with Minky Dot on the other! Ugh! I regretted putting those two materials together, but it ended up being my daughters favorite, so it was worth it in the end! 🙂 Since I have a toddler and need bigger blankets now, I never really cut the material except to trim excess from one or the other side to make them even. A yard of material makes the perfect size blanket for my little girl! monica! two cottons would definitely be too thin. two flannels might be thing, but might be a nice cozy feeling, like a swaddling blanket. minkee or fleece on one side and cotton on the other is a good weight. 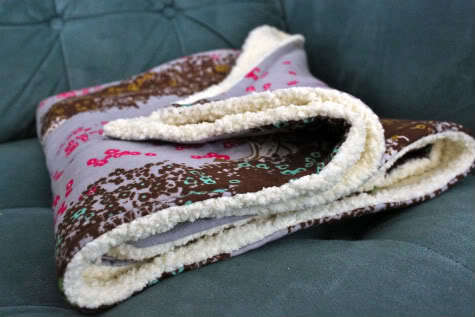 for the thinner fabrics, use our "beginner's baby blanket #3" tutorial to see how to add a layer of batting for a cozier blanket. good luck! so excited to hear how it turns out! My Joann's has that minky right now! In multiple colors! ON SALE! =) It makes me happy. I shall be making this blanket in the very near future. Oh, I love this! If I wanted to quilt the two layers together for more durability, would I have to turn them right sides out, quilt, and then add the final border stitching? I realize this adds more time to the project… that I don't really have… but just in case I'd love to know! Here is my "faux quilt" version on this simple idea. Thank you very much! Thanks for your tutorial. It was a great reference for adding the minkie fabric to the wee quilt I made for my little one. Hi, thank you for this tutorial. I know it’s been a while since you posted but I am brand new to sewing and I found this on a Google search. As soon as I found this tutorial, I got a huge boost of confidence and thought, “I can manage this!” I bought cute fabric at JoAnn’s and was so excited to get started. 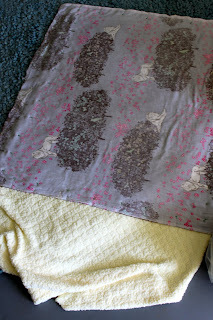 I washed, cut, and pinned (about every 1.5″ to 2″) my fabric yesterday morning during my daughter’s nap. Everything looked perfect and ready to sew. I got started sewing last night but was so disappointed when I finished the first sewing step and then turned the blanked inside out (so the right sides were showing). My minkee fabric has waves in it! It’s almost as if the minkee is bigger than the cotton now even though I cut them the same size. I choose a fluffy minkee type fabric very similar to the one used in this tutorial. What could I have done wrong and do you have any suggestions as to how I could fix the blanket before I sew the perimeter? I reread the post and was wondering how much fabric to buy? I am in love with this fabric, can’t seem to find anywhere. If anyone has seen it i would love love to make for my baby due very soon. Not that I’m complaining, but slow loading instances times will very frequently affect your placement in google and can damage your quality score if ads and marketing with Adwords. Well I am adding this RSS to my e-mail and can look out for much more of your respective exciting content. Make sure you update this again very soon.